A MESSAGE FROM THE PRESIDENT There’s little better than being part of a great story. And you most certainly are. Orphan Sunday started in a small, hard-pressed church in Zambia. The church members had little. But the pastor believed that all Christians are called to express God’s deep love for the fatherless in action. The church responded in astounding ways, some even removing their own shoes for orphans nearby. HOW TO USE THE TOOLKIT A SAMPLE ROLLOUT PLAN Mark these dates on your calendar and use our 4 easy steps outlined in the toolkit to plan your observance! SUMMER 2019 Become familiar with the many resources, sermons, prayer guides and other tools found within this toolkit that can be used to spark a culture of caring for the orphan and vulnerable child in your church. Start to plan what your Orphan Sunday might look like. Form a local leadership or planning team that meets regularly. Prepare for what might happen in the months following Orphan Sunday. Continue to promote your observance and encourage others to attend. Visit CAFOâ&#x20AC;&#x2122;s Church Ministry Initiative at cafo.org/church for more information, resources and tools. Help get the word out about Orphan Sunday in your local community by sending out the Press Release & PSA to media outlets. Adapt and use the bulletin inserts, posters and videos to promote your observance on November 10, 2019. WE’VE MADE IT EASY! Just follow these four steps! Today, churches around the world are gathering with shared vision, voice and purpose to stand for the orphan and vulnerable child. Whatever your event might look like, know that you are not alone and that you are one of many sharing God’s heart for the vulnerable and marginalized. Help interested parties to get involved by hosting an informational meeting. Kick off the new year with strategic follow up from the informational meeting, potentially launching a class/group for those considering fostering/adopting, a support group for those who already are, specific next steps for those interested in getting involved in other ways. Use CAFO’s new resource “Everyone Can Do Something” which details how to host this meeting. TIMELINE OF ORPHAN SUNDAY Today 2018 Over 2,000 churches in the U.S. register their observance of Orphan Sunday and Stand Sunday. A HISTORY OF ORPHAN SUNDAY On Orphan Sunday, Christians stand for the orphan and vulnerable. Orphan Sunday came as a gift from the Church in Africa. While attending a church service in Zambia, an American visitor witnessed the local pastor’s passionate call to care for orphans, in a community that had been ravaged by AIDS and poverty. During that first-ever “Orphan Sunday,” as the service ended, one after another the people stepped forward giving out of their own need, offering their food, and some even taking off their own shoes and placing them in the offering basket for orphans. “God sets the lonely in families.” Proverbs 68:6 That visitor, Gary Schneider, was so deeply impacted by what he had witnessed that he began to help Zambian leaders coordinate Orphan Sunday efforts across Zambia and also shared the vision in the U.S. as well. In 2009, the Christian Alliance for Orphans began providing united leadership to make Orphan Sunday a catalyst for awareness and action across the U.S. and worldwide. Today, churches and organizations in more than 80 nations observe Orphan Sunday annually. Through Orphan Sunday, we join in the promise of “One Day, One Voice, One Purpose.” We pray the church all over the world may be as faithful as our Zambian brothers and sisters to reflect God’s heart for the orphan, both near and far. A two-time national champion, first-round NFL draft pick, and Heisman trophy winner. WATCH TIM TEBOW ORPHAN SUNDAY 2019 Hear what Tim Tebow has to say about taking a stand for vulnerable children on Orphan Sunday. WHAT OTHERS ARE SAYING Leaders around the world have embraced the idea of Orphan Sunday and used its power to change lives. FREQUENTLY ASKED QUESTIONS Orphan Sunday is led by a team of volunteers who give their time to spreading this message of hope for orphans and vulnerable children to the local church. WHEN IS ORPHAN SUNDAY? Orphan Sunday is observed each year on the second Sunday in November. In 2019, Orphan Sunday will be on Sunday, November 10. WHY ORPHAN SUNDAY? God is vested, deeply and personally, in the plight of the orphan (i.e. Dt 10:18; Ps 68:5-6). He calls His people to share this passion and bring to each child the love of Jesus Christ in both word and deed (Is 1:17; Jms 1:27; Mt. 25:40). On Orphan Sunday, the Church is reminded of this truth and invited to act upon it. WHAT DOES AN ORPHAN SUNDAY EVENT OR ACTIVITY LOOK LIKE? Each Orphan Sunday is created by believers in the local church; so its expression varies as much as the people and churches involved. Your church can participate through sermons and Sunday school classes on God’s heart for the orphan, prayer gatherings, fasts and simple meals, studentled fundraisers, foster family recruiting and live concerts. stay connected by joining us on Facebook (www. facebook.com/christianalliancefororphans/) and Twitter (#orphansunday). WHOM DOES ORPHAN SUNDAY IMPACT? As Christians respond to God’s call to care for orphans, lives are transformed. Certainly, orphans and foster youth are changed forever. But it doesn’t stop there. Individual Christians are drawn beyond a self- focused religion to a vibrant, sacrificial discipleship. Churches grow too, as the community sees God’s heart and mirrors it. And, a watching world is changed as it sees the Gospel made visible in Christian adoption, foster care and global orphan care. WHO LEADS THE ORPHAN SUNDAY CAMPAIGN? The Orphan Sunday campaign is led by the Christian Alliance for Orphans (CAFO). 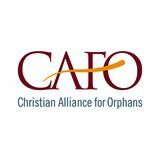 CAFO unites 190+ respected organizations and more than 700 church members who labor together in shared initiatives that inspire and equip Christians for effective orphan care, family preservation, adoption and foster care. WAYS TO PARTICIPATE IN ORPHAN SUNDAY An Orphan Sunday observance can take on many expressions. Weâ&#x20AC;&#x2122;ve put a few ideas together for churches, businesses, ministries and communities of all sizes. And these are just the beginning! Set aside time of intercessory prayer for orphans. 1. Collection Drive for items needed for foster care, orphanages, local children’s homes. 14. Invite a nonprofit organization working with vulnerable children to speak to your group. 2. Create and/or distribute prayer cards for children awaiting adoptive families, needing sponsorships, needing hosting. 15. Plan a fundraiser to benefit orphans and vulnerable children. 3. Set aside time of intercessory prayer for orphans. 4. Fast as an individual or a group. 5. Write letters or cards of encouragement to orphaned and vulnerable children. 6. Gather together a small group and read an orphan-care related book together and discuss. 7. Prepare/Present curriculum related to orphan care to a small group or class, geared to adults, youth or children. 8. Plan an orphan care related sermon on Orphan Sunday. 9. Plan a set of worship songs that reflect God’s heart for the orphan, include the church youth or children’s choir. 10. Commission the families in your church or workplace who have decided to step into orphan care in the next year. 16. Take a love offering to benefit orphans and vulnerable children. 17. Gather together a small group and watch an orphan care related movie together and discuss. 18. Plan a service project to benefit an adoptive or foster family, local children’s home or crisis pregnancy center. 19. Host a breakfast or lunch for local CASA volunteers and/or DFCS workers. 20. Host a ‘date night’ for local adoptive, foster and host families. 21. Stage a visual representation of the 140 Million orphans worldwide, such as 140 pairs of shoes on the church stage. 22. Donate a portion of your business proceeds to raise awareness near the time of Orphan Sunday. 23. Donate to make it possible for foster youth to attend Christian summer camp. 11. Plan a baby or child dedication for the adoptive and foster children in your congregation. 24. Kickoff or relaunch an orphan care ministry in your church. 12. Invite a former foster or orphaned youth to speak to your group. 25. Start a college scholarship fund for aging out foster youth. One Child. That’s all it takes. You’ve seen a lot of big numbers about children in foster care and orphanages. While these numbers seem large, in fact, this is a very solvable problem. There are 5X as many Christian churches in the world as waiting children! Our dream is simple. If you are in the U.S., find a waiting child in your community by searching below. You can select your state at the bottom of the menu. Parents of the children listed have had their rights terminated and are waiting for a family to come forward to adopt them. Others can choose a child in their local village. If you would like help finding a child to pray for, contact your local Coordinator. There is a local coordinator who’s happy to help! Order bracelets for your church and add your Prayer Child’s name. The bracelet will include space for you to write the name and age. 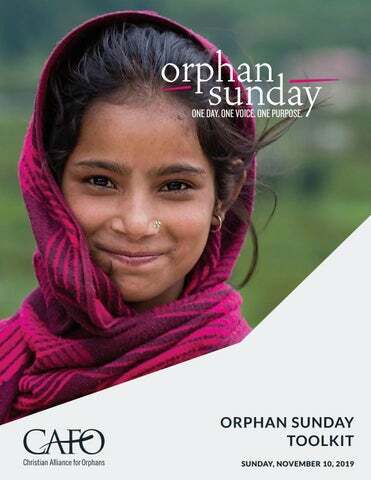 SHORT VIDEOS FOR SUNDAY SERVICE Below is a collection of short videos that can be shown in the weeks leading up to Orphan Sunday, or as part of your Orphan Sunday observance. Use this postcard to handout in your community. Use this poster to hang up around your church, office & community. Use this postcard to invite your pastor, or pastors in your community. Use this to insert into your church bulletin. Use this file to order large format standing banners. Use this as an ad in a publication or a handout to your audiences. Use these cover photos to change your social media profile to share the vision of Orphan Sunday. Change the profile image of your personal or organizationâ&#x20AC;&#x2122;s social profile. We have memes with inspiring quotes and scripture. Use this short radio spot to send to your local radio stations! Use this longer radio spot to send to your local radio stations! CAFO unites 190+ respected organizations and over 700 church members. We labor together in shared initiatives that inspire and equip Christians for effective orphan care, family preservation, adoption and foster care. We work to see the local church in every nation known as the primary answer for the needs of vulnerable children in their midst.